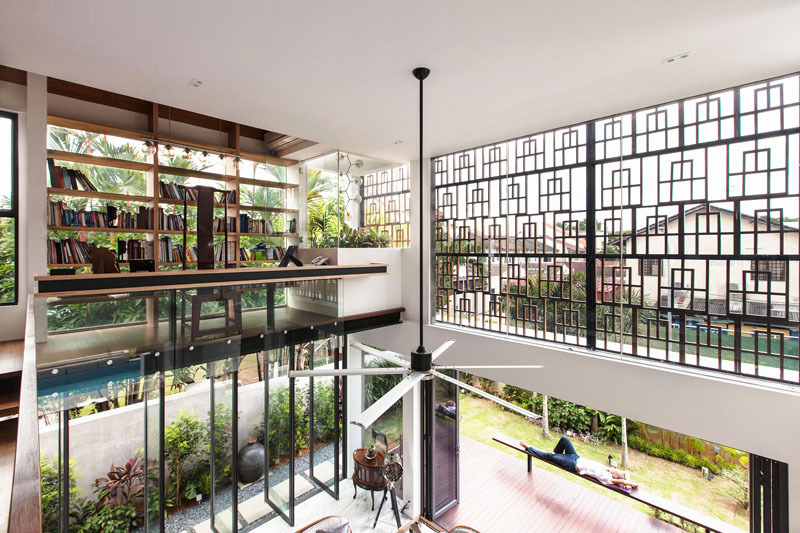 This home creatively used screens for its facade. Apparently, this wouldn’t be the first time that you will hear about screens in the house. When you hear about screens, what would immediately come to your mind are the ones that are intended to avoid flies to come into the house or maybe even fireplace screens as well. But these aren’t the only screens that we are talking about. There are actually some screens that look totally stunning and would bring appeal to a home like the ones we saw in some homes that we have featured on Home Design Lover. Today, we are going to feature another house that has a beautiful design in the exterior using screens. Homes may use different kinds of screens in various types of materials. For this house that we will feature today, it used teak screens. Said screens aims to provide privacy, allow natural light into the home and provide ventilation as well. But aside from these purposes, you will see that the house also looked more beautiful because of the teak screens in it. One reason why the homeowners wanted these screens is because of the location of the house. 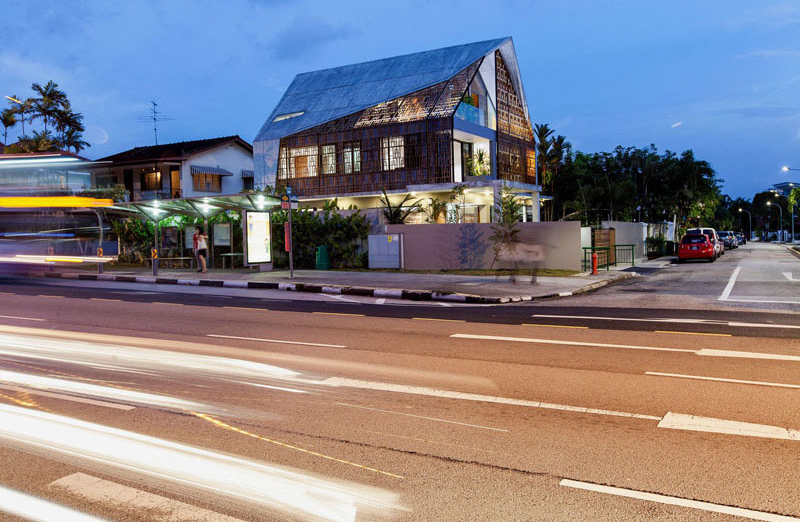 This home in Singapore is situated in front of a bus-stop at a junction of a minor road. The road is always busy with many people in the area. A crowd of people would be seen in front of the house. 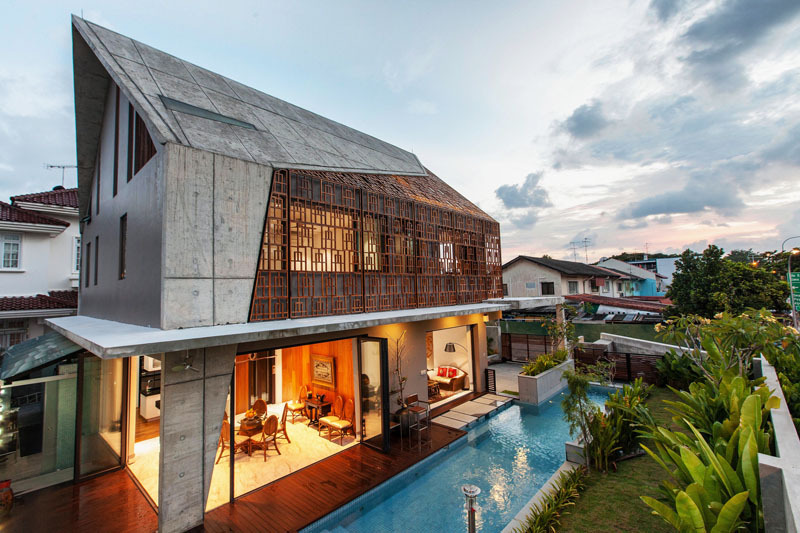 For sure, the house stands out in the area and is an attractive sight for the crowd seeing its combination of teak screen and concrete for the exterior. Let us take a look at the design of the house through the images below. 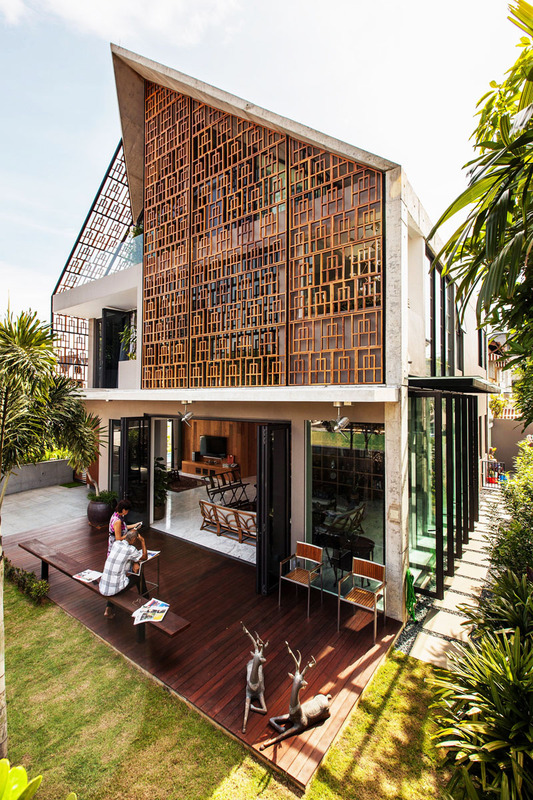 Unique feature: A contemporary home featuring teak screens in its facade which looks totally stunning in the exterior. 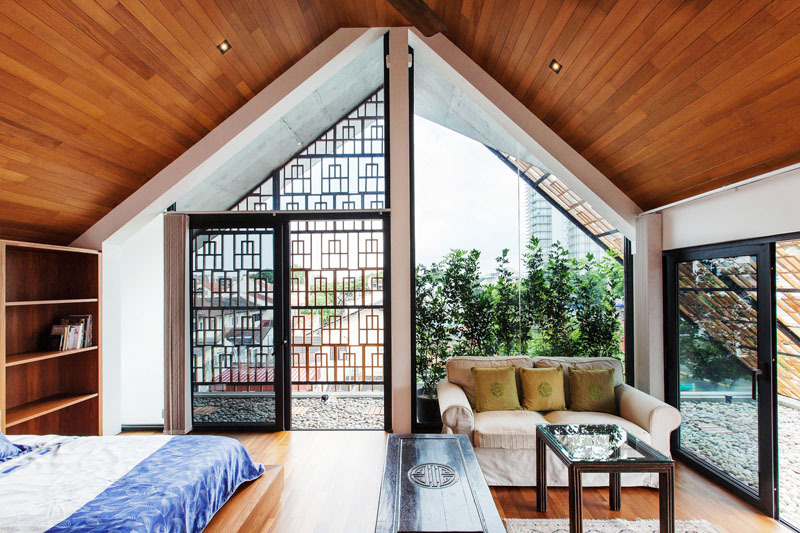 These screens bring privacy to the home, add ventilation and allow natural light into the home. For sure you will agree with me that this a beautiful shot as it blurs the lines of the busy street. But this image also gives you idea of why the owners decided to use teak screens for its exterior. At least, they aren’t that exposed to the street. 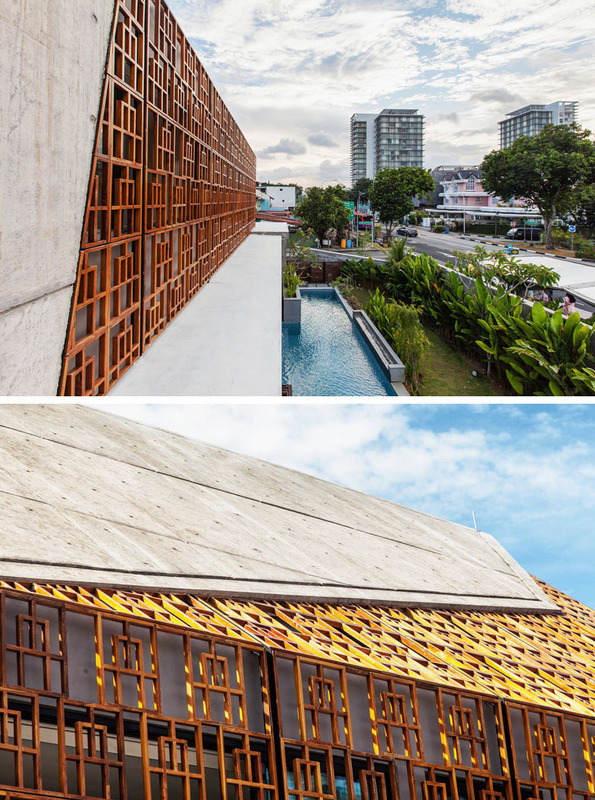 The home combine raw off-form concrete and crafted solid teak screens from Bali which gives it a unique look. 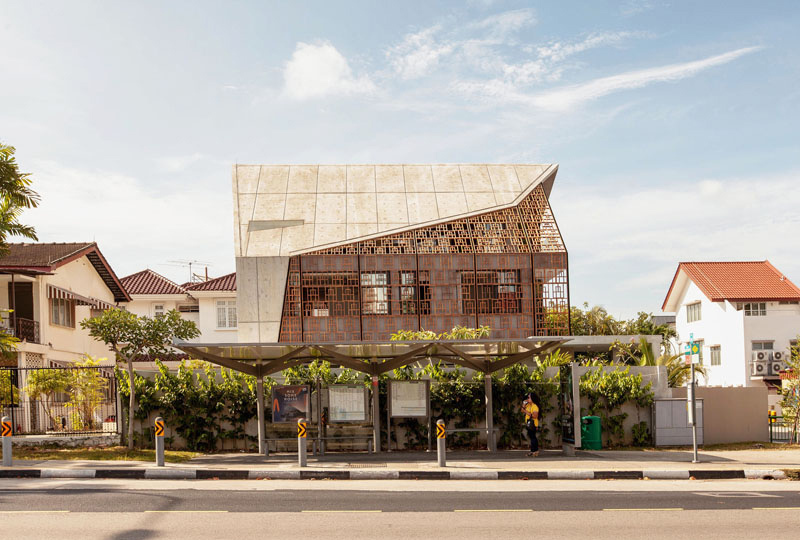 Good thing also that although there is a bus stop in front it, the waiting shed has a beautiful design that seems to compliment with the design of the house. By using the teak screens on the home, they help to protect the home from the harsh urban environment without compromising on views, natural light and ventilation. And it can give the owners privacy, free from the eyes of the people who walk around the street. You can see in this photo the wooden gate as well as some parts of the lower portion of the house that leads to its entrance door. During the night, the house looks even more beautiful because its design is being emphasized. It is also apparent about how it creatively and smartly combined different materials in it. The house used concrete boundary walls and lush landscaping so that the home owners can have a private space to enjoy the swimming pool and main floor without being seen from the street. Well, it wouldn’t be fun to swim when you know that other people are looking at you from outside. How awkward would that be! But because of the design of this house, privacy was achieved even in the outdoor space. Seen here is the outdoor space of the home with wooden decking. You can also see that in the interior there are many other wooden features too. It is also nice to see many plants around the area. And the deer sculptures are cute! A living area in the house which has pivoting glass doors in order to connect the interior to the outdoor space. It is gorgeous to use an eclectic mix of furniture in here with intricately designed area rug. On one side of the wall is a wooden shelf with lovely displays of personal collection of the homeowners. 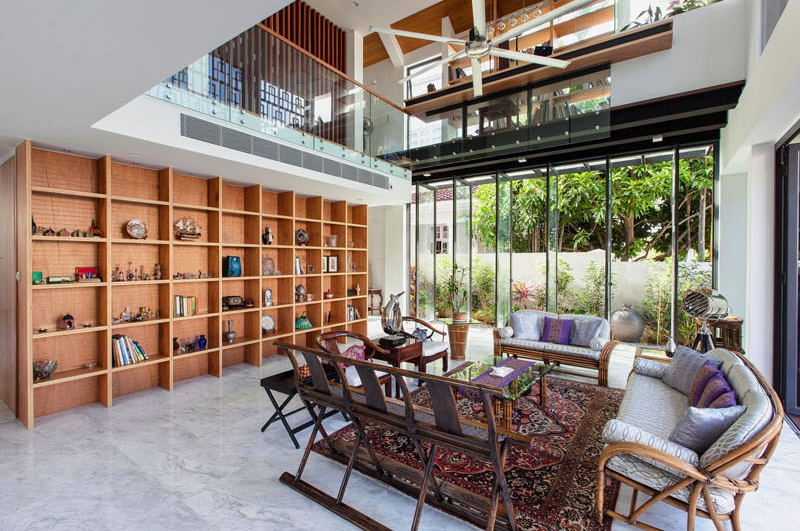 The open living room has a double-height ceiling and large fan, allowing for the air to circulate, which is a much-needed feature for a hot climate. On this side of the living area, it also opens up to the garden with a folding glass doors. I like it that it used various kinds of doors for the home. You can also see here the impact of the teak screens in the interior. Above the main living area is a small library and desk on the mezzanine. From there, one can see the living space ad well as take a look at the view outside through the screens. On the top floor is where you will find the master bedroom with a wood ceiling and little balcony. From the bedroom, one can access that area through the glass door. The bedroom also has a simple yet beautiful seating area. A closer look at the teak screens used in the house. You can tell how these were designed and created meticulously and it looks very beautiful with the concrete used for the house. Who would expect that a home could actually look this stunning with the use of screens? Well, it can actually be achieved with creativity and with the right materials. 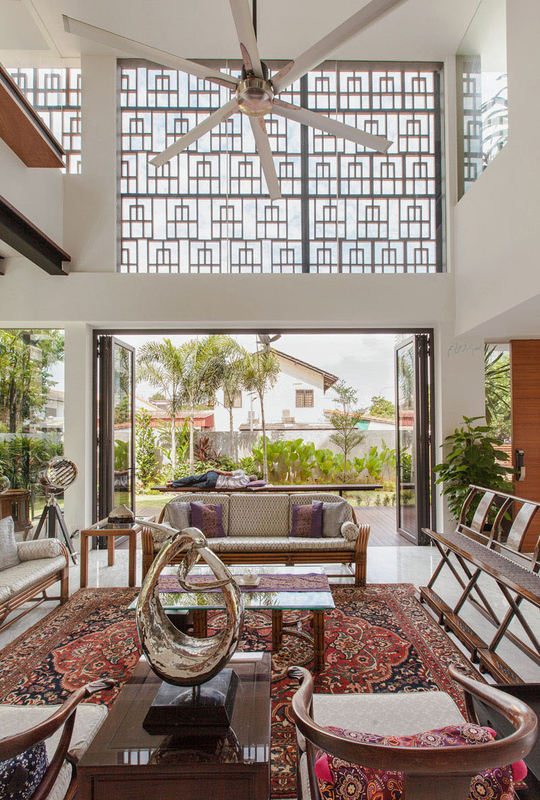 This home is designed by Aamer Architects and it obviously turned out very beautiful because of the screens which added curb appeal to the area. Aside from the exterior, it also brought beauty to the interior of the house as well as it allows natural light to flood into it. In front of the house, you will see plants in it for a refreshing touch. Meanwhile, its interior is very relaxing and looks very attractive and inviting to guests too. Can you tell me which features of the house do you like the most?